Broken garage door remote or keypad? Alpine Sales & Service has what you need. We have a wide variety of garage door accessories available for purchase in the Green Bay Area. Check out our current inventory below and contact us if you have any questions or would like to inquire about purchasing an item. This residential jackshaft garage door opener is compatible with doors up to 14 feet in height and it's easy wall-mount installation makes it a serious space saver. 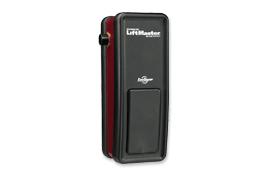 The 195LM Ceiling Mount is compatible with all LiftMaster ceiling mounted garage door openers. Can be used as a replacement remote control for 80 Series, 970 Series, and 370 Series LiftMaster remote controls. Compatible with 315 MHz or 390MHz garage door openers manufactured after January 1, 1993. The Internet Gateway (828LM) adds smartphone control to your MyQ enabled products. Includes core features such as worldwide garage door control and subscription-based partner integrations. For use with garage door openers manufactured after January 1, 1995. This door control incorporates a motion detector that automatically turns on the light when it detects motion in the garage. This three garage door multi-function control panel is designed to replace multiple door control buttons on LiftMaster garage door openers. It can be used as a stand-alone unit or in conjunction with the original factory control panels. The Security+® Remote Light Control is designed to conveniently operate the lights or appliances in your home. The CPT4 4-Channel Remote Control withs with all LiftMaster Security+® rolling code garage door openers.